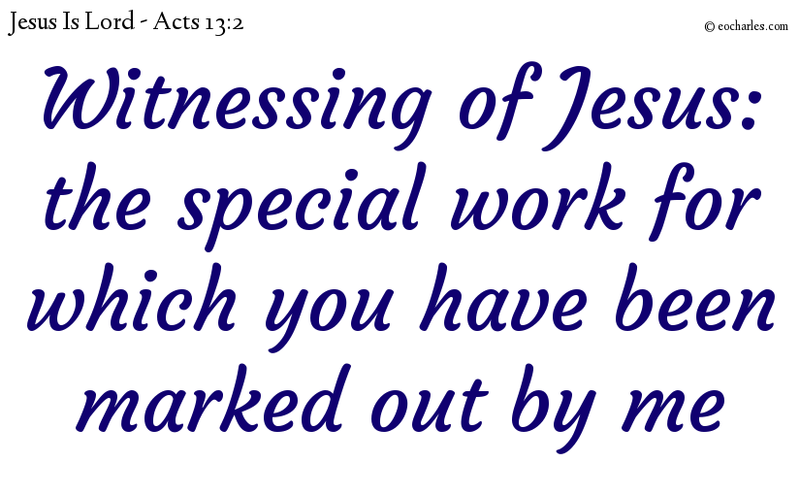 And while they were doing the Lord’s work, and going without food, the Holy Spirit said, Let Barnabas and Saul be given to me for the special work for which they have been marked out by me. Act 13:5 And at Salamis they were preaching the word of God in the Synagogues of the Jews: and John was with them, helping them. Act 13:44 And on the Sabbath after, almost all the town came together to give hearing to the word of God. Act 13:49 And the word of the Lord went through all the country. The witness of Jesus Christ. Act 13:27 For the men of Jerusalem and their rulers, having no knowledge of him, or of the sayings of the prophets which come to their ears every Sabbath day, gave effect to them by judging him. Act 13:28 And though no cause of death was seen in him, they made a request to Pilate that he might be put to death. Act 13:29 And when they had done all the things said in the Writings about him, they took him down from the tree, and put him in the place of the dead. Act 13:31 And for a number of days he was seen by those who came with him from Galilee to Jerusalem, who are now his witnesses before the people. Act 13:33 Which God has now put into effect for our children, by sending Jesus; as it says in the second Psalm, You are my Son; this day I have given you being.